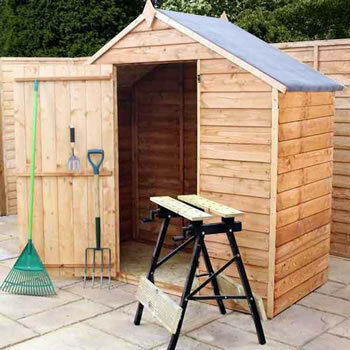 This 7mm Overlap shed offers a great value storage space for your garden. The shed has a 206cm ridge height and is supplied without windows for added security. The 28x28mm frame and high quality rustic overlap board makes the shed strong and sturdy. These quality sheds have a strong braced single door with the roof and floor constructed of solid sheet materials giving the shed a durable structure. The apex roof is shielded from wood rot or fungal decay by the supplied mineral roofing felt.